tribute to personal aspects of her Mom's personal traits and personality. This custom piece required countless hours of tedious design, development and research and convey Debi’s admiration and fondness of the individual portrayed. loved one or friend, please send a photograph of the person to Debi at [email protected] . The price for one of these custom ornaments is $200.00. 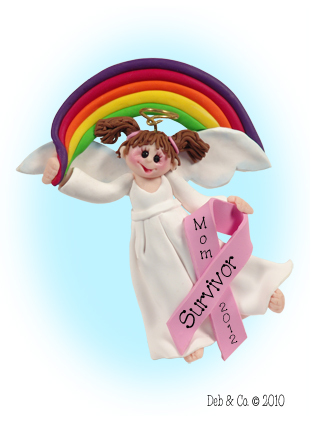 10% of each ornament sold is donated to the "Susan G Koman for a Cure Foundation". Each piece is solely created for the recipient and are in no way for sale to the general public. These are photos of the custom packaging that Deb did for the ornament of her Mom. She even included a photo of her Mom's little Pomeranian, "Sassi"
Deb's mother passed away on January 2nd, 2017. Sassi, the puppy dog passed away shortly afterward in May of 2017. They are both missed dearly.